The user is able to select the content of the RadRichTextEditor in the same way as in MS Word. This is done by clicking on the desired position and dragging to the desired end of the selection. A multiple ranges selection is also allowed. This one is done by holding the Ctrl key while selecting the different ranges. The developer is allowed to work with the selection programmatically. This can be used when having a Find functionality in your RadRichTextEditor and you want to select the found string. Examples that involve the programmatic selection can be found in the How To section. The programmatic selection gets implemented via the DocumentSelection class. The instance of the class gets associated with the RadDocument of RadRichTextEditor and allows you to specify selection starts and ends, selection ranges and other. You can manage the selection by either using the Selection property of the RadDocument or by creating an instance of the DocumentSelection class. Here is an example of how to select the current word. You can implement Multi-Range Selection by either calling multiple times the AddSelectionStart() and AddSelectionEnd() methods or by working with the Ranges collection. 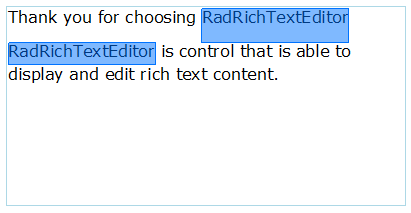 Here is an example of selecting each "RadRichTextEditor" word in the text. This example uses the first approach.